Central Alberta's trail groups are slogging ahead with efforts to develop networks of pathways. Sherry Scheunert, chair of the Central Alberta Regional Trails Society, said they are working on developing the so-called Bluebird Trail between Lacombe and Ponoka. "But our vision is to link up Red Deer to Ponoka, so we're trying to recruit interested folks in the Blackfalds area as well as to make that linkage," said Scheunert before the society's annual general meeting at Dawe Centre on Wednesday night. A draft proposal is in the works and landowners along the proposed Bluebird route are being consulted. The town and county of Ponoka have endorsed the idea. The group now wants to meet the town and county of Lacombe to get their support. No trails have been registered in Central Alberta yet by the society. Work is underway to form a partnership with the J.J. Collette Naturalists to access their property. They are also trying to develop trails in Penhold and Springbrook. Linda Strong-Watson, executive director of Alberta TrailNet, said there is a need to develop trails through the Central Alberta corridor to help complete the Trans Canada Trail. 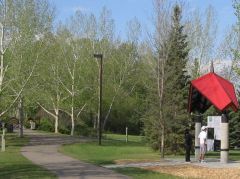 Red Deer's trails are part of the Trans Canada. "One of the projects that is underway is looking at what the potential routes are and completing the connectors in between some of the towns and villages along the route of the Trans Canada Trail." Penhold, Innisfail and Olds are all part of the Trans Canada Trail. "What we're trying to establish and look at right now is how to connect those communities." Transportation studies have been done and the plan is to take a proposal to Alberta Transportation to share right-of-ways in different areas. Negotiations are underway to use railway land near Hwy 2A to create a hiking and cycling trail to Innisfail. "There are large gaps in the area between Red Deer and Calgary with various communities engaged in projects." Strong-Watson said slow but steady progress is being made. Among the hurdles is overcoming the concerns of some landowners. Liability fears have some landowners leery of allowing trails on their land. There are also concerns that taxes could go up if land is used for recreational trails and that they will attract litter. It is hoped that the success of existing trails will convince others to support them. 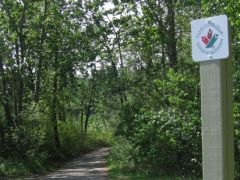 The Trans Canada Trail is a recreational trail that will cross every province and territory in Canada. Alberta also has its own 17,000-km trail system called the Wildrose Trail System that incorporates the Trans Canada. Alberta TrailNet doesn't build or operate trails but provides support to community groups that do. Plans to route the TransCanada trail through portions of Central Alberta have stalled. "We're not working on any trail development in that (Torrington, Wimborne) area right now and probably won't be for some time," said Linda Strong-Watson, Alberta TrailNet coordinator. Started in 1992, the organization's goal is to now have approximately 75 per cent of Alberta's often contentious portion of the trail completed by 2005, she said. While portions of the cross-Canada recreation trail in Central Alberta my be on-line by that time, she said the south-eastern Central Alberta location will likely take much longer to establish. Area landowners there are opposing the establishment of the trail down the abandoned rail line that may run through some of their properties, she said. "We are respectful of the fact that there are some concerns there regarding enhanced liability and that it will be a bunch of urbanites with no sensitivity to the business of farming on the trail," said Strong-Watson. The organization will continue to work on changing attitudes in the area, she said, as the trail is still slated to run down the abandoned rail line there. "There's no other options being considered right now," she said. Work is progressing though on the Innisfail, Penhold, Red Deer link, she said. Negotiations are now ongoing with the provincial government regarding the use of highway right-of-way for the trail between those communities. The provincial organization's future plans will be detailed during an annual general meeting in upcoming weeks.